As with all Motorola phones, the new Z10 and Rokr E8 are innovative but not so much to be considered breakthrough technologies. Click through for specs and some impressions. The rokr E8 is the next gen of Moto's music player phone line. It has a smooth surface, no visible keys. ModeShift / morphing turns the device from phone to music player to camera. They've built in haptic feedback for tactile response when keys are pressed, and a navigation wheel above the touch pad. They also threw in an FM radio, 2GB of internal memory, expandable via MicroSD. USB 2.0 for fast song transfer. It's a Quad Band GPRS/EDGE phone. 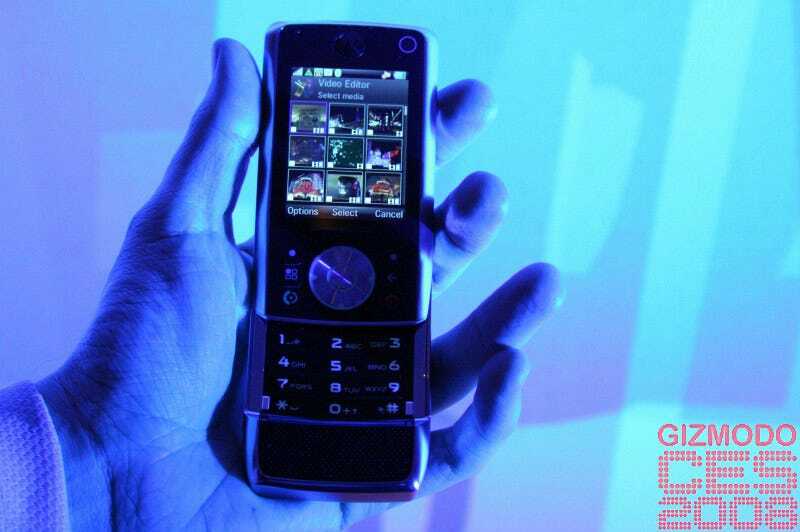 This one is a kick slider multimedia phone, with built-in video editing tools. The 2.2-inch QVGA screen displays video at 30fps, and in 16 million colors. External storage for up to 32GB, when it becomes available. So 8GB for now. 3.2 megapixel camera, which launches in 1.5 seconds-they made a big deal of this although the iPhone doesn't seem to take any longer to get into camera mode. It's3.5G HSDPA, GSM/GPRS/EDGE, for all that wireless video you're going to be uploading.